Isn't it amazing how things always take longer than you expect? I took this week off to catch up: to comment on the month's worth of poems that I haven't written on yet, to edit the semester's worth of poems that I've written and received feedback on, to update this blog and Call & Response, to send out a ton of submissions, to organize my papers, and to celebrate Thanksgiving with my family. So far, it hasn't gone so well. I can say honestly that despite having five straight days in a row off, I haven't actually accomplished a single one of those goals. Cue loud, sad sigh. I have gotten a few things I set out to do done: running a little, taking a master class on the sonnet, sitting in on a Comp & Lit class for observation, sleeping enough, cooking a bit, visiting Shelby for a bridesmaids weekend, seeing lots of James and Emily who are visiting from upstate, keeping almost up-to-date with my work email, updating my amazon wish lists for the holidays, discovering a mouse that lives in our apartment, and, perhaps most impressive, actually getting almost back on track with C&R (seriously, check out the link. We even have new work up!). But, you know. Almost none of those things were what I'd set aside all this time for, and I'm feeling a little guilty about it. I'm going to push through tonight and tomorrow morning to see what I can get done. 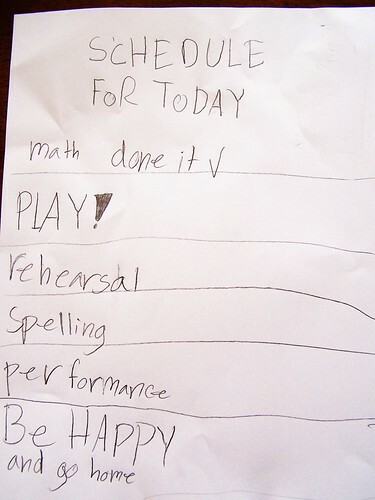 Make some lists. Try not to worry too much about what isn't done yet (holiday cards, Shelby's bridal shower plans, the syllabus I'm supposed to edit), and focus on the important things (as listed above) instead. That photo pretty much looks like the best schedule ever. Sigh. Weren't those the days?